Participate in the 9/11 awareness events happening during the upcoming sixteenth anniversary. There are numerous events taking place locally, with national events webcast to encourage greater participation and provide unity for the 9/11 Truth community. Over the last year since the launch of the 9/11 Truth Action Project and The Lawyers’ Committee for 911 Inquiry at the 2016 Justice in Focus symposium organized by Architects & Engineers for 9/11 Truth, many exciting initiatives have been launched including the 9/11 TAP Petition Project. This year the energy continues with a full slate of activities around the country. The listings below show the major events beginning Wednesday, September 6th through Monday, September 11. Wednesday, September 6, 2017, at 8:00 PM Eastern: Dr. Leroy Hulsey, speaking from the University of Alaska Fairbanks’ Schaibel Auditorium, will present the findings and conclusions detailed in his team’s September 2017 Progress Report, which will be issued the same day. The University of Alaska Fairbanks will host a public presentation on an ongoing study into the collapse of World Trade Center Building 7 at 4 p.m. (4 p.m. Fairbanks Alaska Time – 5p.m. Pacific and 8 p.m. Eastern) Wednesday, Sept. 6, in Schaible Auditorium. UAF researcher Leroy Hulsey is leading the study. He will present the findings outlined in his team’s September 2017 progress report, which will be released the same day. A draft report of the two-year study will be issued later this fall, followed by a six-week public comment period, with a final report scheduled for release in early 2018. 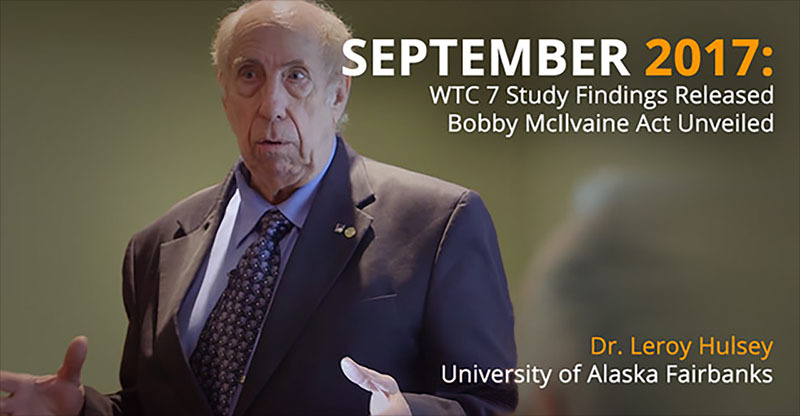 This event and Hulsey’s study is being funded by the nonprofit organization, that has been leading the 9/11 Truth movement since 2007, Architects & Engineers for 9/11 Truth. Live Webcast: Click anywhere on the image to view the LIVE STREAM on Wednesday, September 6, 2017, at 8:00 PM Eastern. See this event listing on the 9/11 TAP Events Calendar. Take the #4, 5 or 6 subway to Brooklyn Bridge/City Hall Station. Newsbud presents, First Annual 9/11 Activist Summit. This event features a one-of-a-kind all-star panel for the 16th anniversary of the September 11 attacks which explores the road forward for a real and legitimate 9/11 Truth Movement. 9/11 marks the birth of a ploy marketed as the “Global War on Terror” and used as justification to carry out endless wars without borders- perpetual war waged globally by the United States and NATO. 9/11 became a stepping stone towards the relentless assault against civil liberties and for the rise of the Police State, not only in the United States, but across the globe. Today, 16 years after the tragic events of 9/11, billions of people remain misinformed and misled regarding the real culprits, causes and consequences of the September 11, 2001 attacks. In this live and interactive online conference Newsbud brings together distinguished panelists and surprise guest appearances from the 9/11 whistleblower community, best-selling authors, globally acclaimed journalists, producers and scholars. Our distinguished panel consists of the following presenters. Additionally there will be surprise appearances by several well-known and respected guests from the 9/11 whistleblowers and scholars community. Host & Presenter: Spiro Skouras- Newsbud Executive Producer & 9/11 Activist. Registration is required. The number of seats is limited, and registration will close on Thursday, September 7, 2017. Price: $145 (Newsbud Community Members) $180 (Nonmembers). Monday, September 11, 2017 at 1:00 PM Eastern: Bob McIlvaine, Peter Ketcham, and Richard Gage will announce the “Bobby McIlvaine World Trade Center Investigation Act” at the National Press Club in Washington, D.C. Later that day and the following day, we will hand-deliver the Bobby McIlvaine package to all 535 members of Congress. Visit the National Press Club’s website for more info. A live webcast is planned and the National Press Club requires the use of its in-house live stream service. More information can be found on the National Press Club’s website. Keynote speaker – Dr. William F. Pepper is a human rights lawyer most known for his defense of James Earl Ray in the trial for the murder of Martin Luther King, Jr. Pepper is also the chief attorney for Sirhan Sirhan and has worked for over a decade to get a ruling for a retrial for the murder of Senator Robert Kennedy. Pepper has represented governments and heads of state, and has appeared as an expert witness on international law issues. In his 2016 book “The Plot to Kill King: The Truth Behind the Assassination of Martin Luther King, Jr.”, Pepper reveals dramatic new details of the night of the murder of Martin King, the trial, and why Ray was chosen to take the fall for a government-sanctioned assassination. His findings make the book one of the most important of our time—the uncensored story of the murder of an American hero that contains disturbing revelations about the obscure inner workings of our government and how it continues, even today, to conceal the truth. Bill Pepper has also been active in the 9/11 truth movement, including giving a keynote address at the historic 9/11 truth conference held in Chicago in 2006, and working closely with a distinguished team of lawyers now assembling a 9/11 legal strategy. Additional speakers include authors Dr. Anthony Hall, Dr. Kevin Barrett, Mickey Huff, Director of Project Censored. More details about the speakers, films and schedule can be found on the website sf911truth.org. Tickets $15 at the door, no one turned away. Come join Richard Gage, head of Architects and Engineers for Truth (A&E911Truth.org), Peter Ketchum, NIST whistle blower, Barry Kissin, Lawyer and anthrax expert, and other experts at a 9/11 conference panel at this dinner event in the Washington DC area. Doors open 6:30 p.m., conference starts at 7:00 p.m..
$14.00 entrance fee includes dinner. The 9/11 TAP events calendar has other activities listed. If you would like your event(s) listed, contact us.